"Shadow Foreign Secretary William Hague's Jan. 31 speech to the Royal Institute of International Affairs -- Chatham House -- spoke of a "solid but not slavish" alliance, and called for "the effective management of the relationship with the United States of America." These controversial words caused significant political damage here. It echoed Mr. Cameron's "liberal conservative" speech given on the fifth anniversary of 9/11, where he spoke of the need for "humility and patience" in conducting foreign policy." 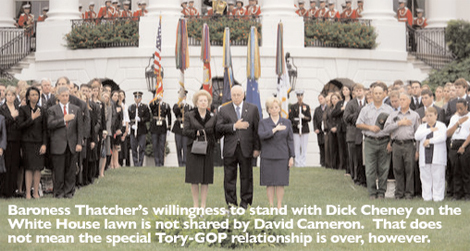 My own view is that there is no hostility between the Tories and the US/ Republicans. What there is - is an unwillingness on the part of the Conservative leadership to combat the anti-Americanism that is rampant across Europe. David Cameron is reluctant to spent his political capital on making the case for co-operation with the USA on missile defence or any other controversial venture. The blame for this is certainly not all on the Tory side. David Cameron was at Michael Howard's side when Mr Howard made his unfortunate 'if I knew then what I know now' remarks. Michael Howard was silly to make those remarks but there was something childish and short-termist about the White House's 'you can't expect to visit us' response. "Perhaps the greatest benefit that Britain derives from the special relationship, and Tony Blair's close tie to George W. Bush, is the almost invisible security embrace, and close intelligence cooperation, that Washington gives only to its closest ally. U.S. intelligence, after all, helped thwart a series of large-scale al Qaeda attacks on British targets, including Heathrow Airport and Canary Wharf, which had been planned by 9/11 architect Khalid Sheikh Mohammed. Standing shoulder to shoulder with the U.S. may not be the most popular policy in Britain, with few votes to be gained, but it is fundamentally in Britain's interest." In the meantime groups outside of the party must help to combat anti-Americanism. 18DoughtyStreet.com's A World Without America video - the start to an anti-anti-Americanism campaign has been widely covered on TV and radio and has been watched more than 250,000 times so far. David Cameron accused the Government of breaking a promise to increase the number of NHS beds by 7,000. The Tory leader said that the number of beds had actually fallen by a similar amount. After questions on the NHS, David Cameron asked Tony Blair about the Milburn-Clarke policy debate meeting. The Prime Minister said that he was "delighted that a full policy debate is happening in the Labour party." Referring to Frank Field's intervention of last weekend the Conservative leader said: "The Prime Minister seems to think the Chancellor is Einstein but half the backbenchers think he is Mrs Rochester. Why do you not let him out of the attic?" Ming Campbell asked about missile defence and when the Government would present its plans to the Commons. The issue (discussed on ConservativeHome on Sunday) would be brought before the House, Mr Blair suggested, when the Government had something definite to say. 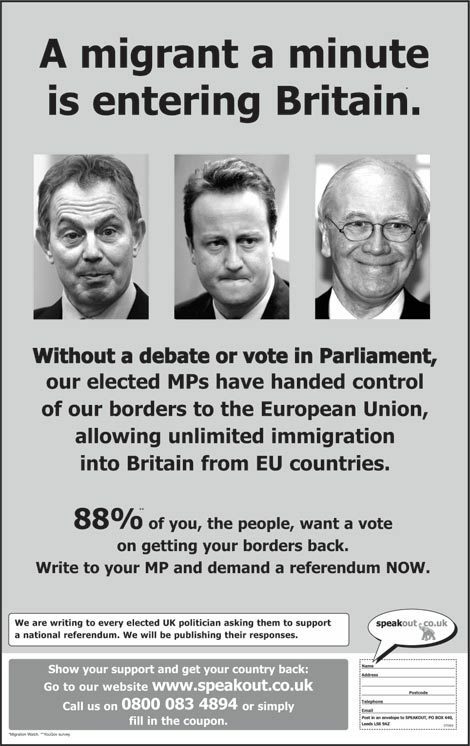 The advert below appears in today's Telegraph but its publishers - SpeakOut.co.uk - allege that others newspapers including The Sun, Express and Mail have refused to publish it. The advert is apparently too "inflammatory" and "potentially racist." What do you think? "My daughter – how sharper than a serpent’s tooth – has become a Euro-fanatic. She points excitedly whenever we pass a twelve-star flag. She nags me about moving permanently to Brussels. She grins from ear to ear whenever she hears the EU anthem, Beethoven’s Ninth Symphony. (It has much the same effect on her father, by contrast, as on Alex in A Clockwork Orange, and for the same reason: bad connotations). She is, in short, the model European citizen. And she’s only five years old. It’s all a question of perspective, I suppose. For her, Brussels means Eurostar journeys and eating in restaurants and being allowed frites and dame blanche because Mummy isn’t there. It means exploring the quirky corridors of a building that, to a young child, must seem like a mediaeval castle. It means playing with Daddy’s bubbly researcher Rebecca. It means being made a fuss of by the ushers and security guards and kitchen staff who can remember when she was a baby." The revelation comes on Dan Hannan's excellent new blog for The Telegraph (now added to 'the Editor's blog choice' in the right hand column). His post on his daughter's Europhilia introduces a more serious point that there are very few true believers in what has been called the Greater Belgian Empire. The people who like Europe are Miss Hannan (because of frites), MEPs (who like the generous salaries and Brussels dinners) and nations like Ireland (because of subsidies). Notice the common factor? Read the full post - How The EU Bought My Daughter - here. Grayling: "We do not need and do not want a national, spy-in-the sky, pay as you drive scheme"
There has been some debate on this site about the Conservative Party's views on road-pricing. Chris Grayling has drawn my attention to an eleven hundred word article that he penned for the Evening Standard on 13th February. The article pasted below - Listen To The Protest And Just Go Local - essentially says that the party is opposed to a national programme of road-pricing but in the spirit of the party's new emphasis on localism, it supports the freedom of local government units to choose their own models - like Ken Livingstone's congestion charge. "That this House recalls the cruel and divisive reign of Margaret Thatcher and demands that the statue be removed from the Members' Lobby until such time as its erection has been approved by a vote in the House." One thing we can be sure of is that Parliament won't even think of erecting a monument to the achievements of Mr Hepburn. Related link: The bronze lady. "the great achievements of Baroness Thatcher in changing Britain for the better; including curbing excessive trades union powers, standing up to naked aggression in the Falklands, extending popular capitalism, giving millions of Britons the chance of home ownership, and helping to win freedom for millions of people in Central and Eastern Europe, and believes that an impressive statue in members lobby is a fitting tribute to Britain's first female Prime Minister." The Conservatives have an 11 point lead in this month's CommunicateResearch poll for The Independent. The Party has gone up 6 points from 34% in last month's CR survey, which would convert into a Commons majority of approximately 100 seats. Labour have remained below the 30% mark and the LibDems have fallen 4 points. The full breakdown of the results are on the CommunicateResearch website. This poll pushes the Conservatives ahead by 7 points in the ConservativeHome Poll of Polls. The nominations for the National Convention's elected positions have been finalised. Successful nominees also sit on the Party Board ex officio. Current Chairman Don Porter CBE, a Deputy Chairman of the Party and former President of the Convention, has for the second time been the only person to apply for the Chairmanship and has therefore been reselected by default. The Presidency of the Convention was again uncontested, this time with Simon Mort - a Vice President this year - being automatically selected. There are four nominees for the three Vice Presidential positions: Charles Barwell, Jeremy Middleton, Emma Pidding and Richard Robinson, a regular contributor to ConservativeHome. Ballots will be sent out this week and there will be a hustings at the Convention's AGM held at Spring Forum. The only other time the Convention meets is at the main Party conference. Donations to the Party in the last quarter of 2006 amounted to a healthy £5.3m - more than Labour's £2.64m and the LibDems' relatively impressive £2.32m, combined. The parties also paid back around £300k of the £60.8m they have borrowed. 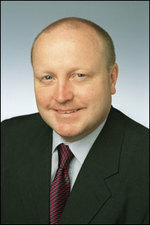 Andrew Pierce revealed last week that the Party is still in debt to the tune of £8million despite selling off Smith Sq. The Blah Party apparently received £168k! "Allowing Gordon Brown into No 10 would be like letting Mrs Rochester out of the attic. He has no empathy with people. Tony Blair walks and talks like a Prime Minister and Gordon Brown doesn't, that's all there is to it." 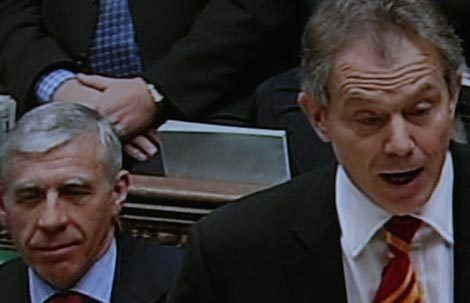 The independently-minded Labour MP even speculated that Blair might be persuaded to stay on if a major security incident occured. 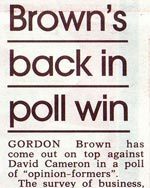 "People would not trust Brown to deal with it," he told the Mail on Sunday. Mr Field - who has encouraged David Miliband to enter the leadership race - fell out with Gordon Brown when he was Minister for Welfare Reform and the Chancellor frustrated his plans at every turn. There's an interesting story on PoliticalBetting.com speculating that Iraq war rebel John Denham might be the ideal challenger to Mr Brown. As well as being able to distance himself from the Iraq war, the Chairman of the Home Affairs Select Committee is also a good communicator and represents a southern seat. ConservativeHome has been arguing for our party to support missile defence for some time (and Mark Pritchard MP discussed the issue on YourPlatform last May). It is encouraging, therefore, to see the issue finally on the national agenda. "The defence shield is a development of the 1980s Star Wars programme that planned to destroy any multiple rocket attack from the Soviet Union. Rather than shooting down dozens of rockets, this system would take out only one or two missiles in space with 16,000mph interceptors." "Putting American interceptors on British territory would be political dynamite and is bound to give renewed life to the anti-nuclear lobby which has such strong and bitter memories of the days when this country hosted US cruise missiles at Greenham Common in the Cold War. However, what is the alternative? Britain cannot afford to go it alone in developing an anti-missile system, but if Iran and other countries in the Middle East become nuclear weapons powers, there will have to be an insurance policy, and the only material one on offer at present is Son of Star Wars." It is 100% right that Her Majesty's Opposition asks the tough questions but we must not seek to divide Labour's leadership from its increasingly anti-American backbenchers if that could risk losing UK support for missile defence. The Tory leadership must do as David Cameron did on the Trident decision and seek bipartisan support for our only possible defence against a rogue missile attack. "I worry because men of power who take instruction from unseen forces are essentially fanatics... Those who look for judgment not from the electorate or parliament or a free press but from God release themselves from the constraints of democracy." The greatest killers of the last century weren't religious "fanatics" but atheists. I think of Stalin and Hitler and Pol Pot. Not all religions are the same. Some religions are defined by the teaching of forgiveness and peacefulness. Others are more open to interpretations that lead to violence. It's a bit rich for Mr Portillo to imply that Christian leaders like Bush and Blair want to "release themselves from the constraints of democracy." Both men have been more successful voter-getters than Mr Portillo. I'd rather have a leader that felt a deep sense of accountability to his maker than someone who thought he could get away with anything if noone was looking. Christian men have been at the forefront of many of the great reforms of our times. I think of William Wilberforce's campaign against slavery (something Mr Portillo acknowledges) but also Shaftesbury's educational and mental health missions and, more recently, Martin Luther King's civil rights campaigns. In the Conservative Party today it is interesting that many of the great compassionate causes are being led by Christians - think of social justice (IDS), international development (Peter Lilley), combating domestic violence (Caroline Spelman) and international human rights (Gary Streeter and Ben Rogers). Britain is much richer for the involvement of Christians in public life. Christian schools generally outperform secular schools and a disproportionate share of the country's charities and volunteers are faith-inspired. If you want to understand philanthropy you have to understand the 'God factor.' A recent analysis of giving in the US proved that religious motivations were more powerful than any other factor in determining generosity. Are Christians perfect? Of course not and there are many Christians who would would make bad governors but the overwhelming contribution of Christianity to public life is beneficial. Sam Coates and I spoke too soon. On Thursday night's edition of ConservativeHome TV (watch it here) we welcomed the fact that Labour had not attacked David Cameron's emphasis on the family. We hoped that - finally - Labour was willing to accept the overwhelming evidence that most children do better when a mother and father are active in their lives. On top of that there is also the fact that mother-father involvement is more likely to be reliable if the couple are married. 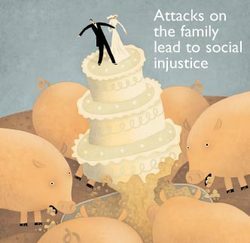 David Cameron has had the courage to embrace Iain Duncan Smith's evidence on marriage and Labour's silent response appeared to suggest that - in their hearts - the Government knew that family breakdown was a root cause of underachievement, crime and incivility. The front page of today's Observer suggests that Labour are about to return to their old ways. And they are old ways. Alan Johnson is apparently going to warn that family policy should not be based on 'the prejudices of yesterday's generation' but he is the one with throwback views. Saying that marriage and fatherhood didn't matter was plausible in the 1960s but the evidence has now poured in and that evidence says that marriage and fatherhood are among the most important weapons we have in building social justice. The only thing that can be said for Labour's Woodstock warriors is that they are still capable of a good soundbite. Harriet Harman tells the Observer that Cameron's arguments amount to 'Back to Basics in an open-necked shirt.' Nice line from Labour's wannabe Deputy Leader but a terrible disservice to Mr Cameron's arguments and to her Peckham constituents. If she really cared about them she'd be arguing for policies that would encourage more active parenting and the institution of marriage. Unfortunately a pro-fatherhood, pro-marriage consensus will have to wait until the Labour left cease the party politics. Labour like to think of themselves as the party of social justice. They need to understand that you cannot be the party of social justice and be opposed to the family. "Hi, Margaret? Hi, it's Gordon." 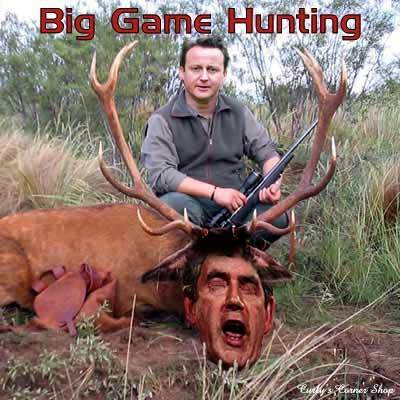 "Deer stalker Dave can fell two stags with one shot"
"David Cameron risks offending animal rights campaigners after details of his secret passion for stag shooting, one of the bloodiest field sports, were revealed." I'm actually quite impressed. As the article continues: "[Cameron] is one of the few marksmen skilled enough to shoot two stags in one go." 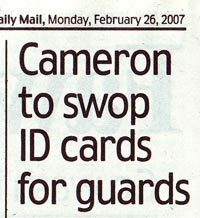 Sunday morning (8.45am) update: "The disclosure about Mr Cameron's involvement in deer stalking comes after the Independent on Sunday revealed that he was disciplined at Eton for smoking cannabis and also published details of Mr Cameron's membership of the elite Oxford drinking society, the Bullingdon Club. The exclusive, all-male dining society was notorious for drinking and high jinks. Mr Cameron was photographed in 1987 with other members of the society wearing a royal blue tail coat with ivory lapels. Labour intends to use the group photograph in its general election literature." Rising stars Michael Gove and Nick Hurd are tipped for promotion to the shadow cabinet (I'd be delighted to see Michael Gove get a seat at the top table. Ed Vaizey should also be there. Ed is one of the party's very best communicators. Greg Clark should replace Theresa Villers as Shadow Chief Secretary to the Treasury. Greg is one of the party's best brains). Promotions for Chris Grayling and Alan Duncan (both are two of the hardest-working members of the shadow cabinet team - particularly Mr Grayling - and score highly in the ConservativeHome monthly ratings). Andrew Lansley and David Willetts might be given broader strategy and policy roles (no strong feelings on these two very able spokesman although there are benefits to keeping people in place in key portfolios like this so that they are masters of their briefs). Francis Maude to move to policy role and to be replaced by Liam Fox (Francis Maude's unpopularity with the grassroots means that he must be moved but Dr Fox will not want to go back to CCHQ although he is the sort of figure who could energise the party's core supporters). Missing from Toby Helm's report is ConservativeHome's hope that David Cameron will have the courage to swap George Osborne and William Hague. As previously argued: "George Osborne’s pro-American, Eurosceptic and hawkish views will make him an ideal Foreign Secretary. If Hague can become full-time after his much-anticipated Wilberforce book is finished he’ll be a reassuring Shadow Chancellor opposite Brown's likely successor, Alistair Darling." Keep Nick Herbert in charge of police reform. It is one of the party's most promising policy initiatives and Nick is the person best equipped to deliver it. David Burrowes, one of the Commons' most decent members, to be given a social justice role because of his long-standing interest in compassionate conservatism. Nadine Dorries to become a Vice Chairman of the Party. She is one of the party's best advocates and should be given a communications role for the party. 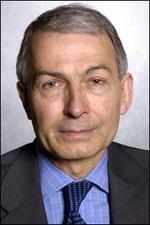 Put the Shadow Minister for Homeland Security into the shadow cabinet. Francis Maude will announce tomorrow that the Conservative Party Conference will be held in Manchester both in 2009 and 2011. This follows a trend of moving conferences to larger, more northern destinations. Spring Forum was held in Manchester last year and was generally well-liked by delegates, and we recently revealed that the next Spring Forum will be in Gateshead and the 2008 Party conference in Birmingham. If this has whetted anybody's appetite for Party conferences, you can spend your Friday evening reading over the sixty-odd articles written by ConservativeHome's Bournemouth 2006 reporters! Well, almost. This week saw a concerted effort by the Party to woo voters in Northern Ireland. Although it largely went under the media's radar, David Cameron was in Northern Ireland again on Monday - the third time since becoming leader. Apart from a 1997 flying election visit by John Major, I believe this is the first time a Conservative leader has actively campaigned for Conservative candidates in NI. "One of the reasons we are standing is to say to people in Northern Ireland politics doesn't have to be like this. It should be about the quality of your school, the quality of your hospitals, the choice you get in public services, supporting the rule of law, backing the free enterprise system." Cameron was accompanied by David Lidington and James Leslie - a high profile Ulster Unionist defector seen as the most likely candidate to win. Before Cameron arrived, Sir Reg Empey of the UUP had challenged him to say whether the Conservatives would be classed as Unionists or Non-Aligned. He made it clear it would be as Unionists. Cameron also gave a cautious welcome to Sinn Fein's endorsement of the Police, applauding the vote but challenging it to be realised on the ground. NI politics is very narrowly focused on domestic division, there is clearly a lot of frustration that public services and other major issues barely get a look in. Whether it can be "normalised" remains to be seen, but it's definitely worth a try. Northern Ireland isn't the only unfamiliar territory the Conservatives are venturing into at the moment. 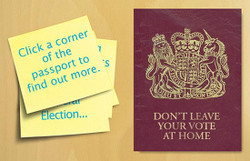 Conservatives Abroad have recently launched Don'tLeaveYourVoteAtHome.com. Francis Maude has been in Australia this week courting the not insubstantial number of expatriates living there (up to 1.3million). Like campaigning in "no hope" constituencies these initiatives may not reap swift rewards, but the Party has to start these long-term projects at some point! On yesterday's ToryDiary I agreed with Peter Riddell that UKIP weren't the main threat to the Tories but I'm more interested in the danger of possible Tory voters floating between voting and staying-at-home (Bromley-style). Peter Riddell appeared more interested in voters floating between the three main parties. The graph above - given to me yesterday by MORI's Ben Page - adds a little to the debate. 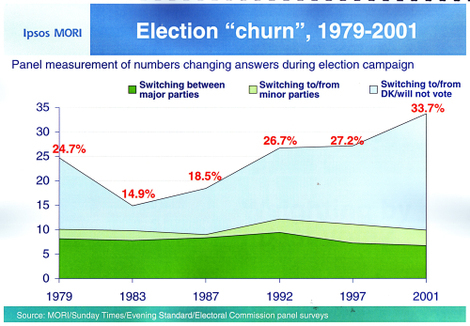 It does show a large increase in voters 'churning' between voting, not knowing and not voting. Ben Page has kindly agreed to look into that increase and hopefully provide a few breakdowns of the number for ConservativeHome readers. When are the LibDems going to be asked to repay £2.4m from Michael Brown? The Electoral Commission's likely demand that UKIP forfeit £363,697 of donations may "ruin" Nigel Farage MEP's party according to Brendan Carlin in today's Telegraph. The repayment demand is much bigger than the party's claimed annual income of approximately £250,000. Brendan Carlin, who was first on Fleet Street with the story, notes that the donations from retired bookmaker Alan Bown were illegal because Mr Bown failed to ensure he was on the electoral register at the time of his donation and UKIP failed to check that he was registered. Under the Political Parties, Elections and Referendums Act of 2000 all illegal donations are not returned to the original donors but go to the Treasury. Alan Bown's money will end up in Gordon Brown's pocket. And that brings us on to another Brown... If the Electoral Commission succeeds in reclaiming UKIP's money there should be new pressure on the LibDems to forfeit the £2.4m that Michael Brown gave to Charles Kennedy's 2005 election effort. That Mr Bown, always a UK resident and taxpayer, was ineligible to give to UKIP was something of a (not insignificant) clerical error. The vehicle that Michael Brown used to give to the LibDems was "fraudulent and never traded" (Times). Why one rule for UKIP and another for the LibDems? A YouGov/ Telegraph opinion poll gives the Tories a (stable) 5% lead tomorrow. Graphics will follow in the morning. Perhaps more significant is the fact that the Tories have a 30% to 27% lead over Labour on economic competence. That 3% advantage compares very favourably with a 22% disadvantage (49% over 27%) at the last General Election. The Tories are not perceived as decidedly more competent but Labour (Gordon Brown) is seen as decidely less competent. Perhaps that record tax burden, rising inflation and falling disposable incomes are beginning to bite! Bob Worcester believes in an iron triangle of political success. That triangle includes leader image, party unity and economic competence. David Cameron still has a lot to do but he can be forgiven a broader smile tonight. "Well over half of YouGov's sample, 57 per cent, agree with Mr Cameron that "the shootings reflect a wide malaise" and that "our society is broken, with a marked decline in the culture of responsibility, especially among children without fathers". Only 33 per cent agree with Mr Blair that the shootings reflect only "a specific problem with a specific criminal culture to do with guns and gangs"." Appearing to confirm Tuesday's Guardian/ ICM survey, the Tory lead widens to 9% in a Brown versus Cameron stand-off. "We need to make it as socially unacceptable for fathers to avoid their responsibilities as drink-driving now is. As with drink-driving, it is a combination of government action and culture change that will make the difference. In a thoughtful and forensic paper published by our Social Justice Policy Group today, Iain Duncan Smith sets out clearly the central task: making sure that young people grow up with a strong male influence in their lives. He points to the success of welfare reform in other countries to reverse the growth in lone parenthood. And he calls for a new focus on keeping male prisoners with children in touch with their families — a vital link which helps cut the chance of re-offending." The Daily Mail likes it, too. The Mail notes that President Bush's Healthy Marriages Initiative appears to be inspiring the Tory leader. This is good news as practical support for marriage in the form of mentoring and education - alongside tax breaks - is vital to support marriages during difficult times and to prevent 'unhealthy marriages' from starting in the first place. Related link: Download a PDF of the Social Justice Group's report here. Her legacy is all around us; Tony Blair's is chiefly in Iraq. He may have stayed away last night, as the seven-and-a-half foot statue of Lady Thatcher was unveiled, but one day, if as a plain MP he should ever pass through the Members' Lobby, he will see the statue towering above him. Here she has been placed in the company of Winston Churchill, David Lloyd George and Clement Attlee — all, in their ways, great men, and all of them, like Margaret Thatcher, prime ministers who left a legacy to be proud of. With such people, at least, she has received her due." 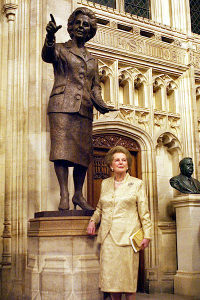 Talking to one MP last night he noticed how her statue stands in front of a much smaller bust of Ted Heath. He still lives in her shadow - even in death. The Great Sulk can continue. Related link: Iain Dale on the unveiling.